Rotary was conceived and founded in 1905 by a Chicago lawyer, Paul Harris, who because of the loneliness he felt in the big city mentioned the idea of fellowship rather than making money from each other, to 3 business friends and at the first meeting on the 23rd February 1905 the Rotary Movement was started. In1911 it crossed the Atlantic and by 1914 eight Clubs had been formed in Great Britain & Ireland. Through the enthusiasm and encouragement of George H Roberts the local district Superintendent of the Prudential Assurance Company ("the man from the Pru") a group of 9 professional men called an interest meeting at the Grand Hotel, Albert Street on Thursday 20th April 1922 where Rotarian Vivian Carter, Secretary of the British Association Rotary Clubs, spoke about the Rotary movement and a need to form a Club in Rugby. On Friday,9th June 1922, an inaugural lunch was held at the Grand Hotel when the speaker was Rtn William Hadley Secretary of the Northampton Club (formed in1921), who gave an address on "The First Duty of a Rotary Club" . 21 members were present with 7 visitors. 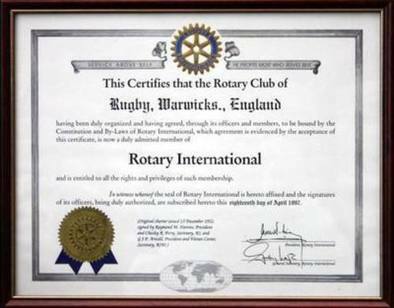 On the 20th June 1922 the Club was officially affiliated to Rotary International in Great Britain and Ireland (RIBI) and became it's 85th club and the 1317th club in the world.